This year, I wanted to make it a goal to reduce the number of physical books I own that I haven't read. I don't think I'm alone in saying that I have quite a lot of books that are just sat unread on my shelf. The number is sitting at about 180. It's got to the point where my family won't buy me books for Christmas or birthdays because they don't see the point when I have so many unread books already - and really, they're right! It's not even that I bought these books a while ago and have since gone off them. I'm still so excited to read most of them! I feel like I just can't read fast enough because I constantly want to pick up another one from my shelf. It probably doesn't help that I have my books split into read and unread on my shelves, so I can see them all together in one big group. So I tried to think about how I could make this work. This is something I've been saying since around the middle of last year and, of course, it just never happened. Now, I really hate restricting myself when it comes to reading. 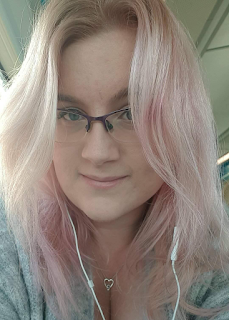 I don't do book buying bans, I don't make strict TBRs, because I really like being spontaneous when it comes to books, so I needed a way of making sure I got my TBR number down that was still pretty fliexible. Enter the Book Balance Sheet! Click here to download a copy of the book balance sheet to use yourself! The thing I love about this is that you can make it easier or harder, depending on how many books you read/buy. The main bit with the balance sheet is the monthly total. I'm setting my goal for -5, but you could set it for whatever you like, and if I find that this goal is too difficult or too easy (doubt it!) then I can always change the number and everything else will stay the same. 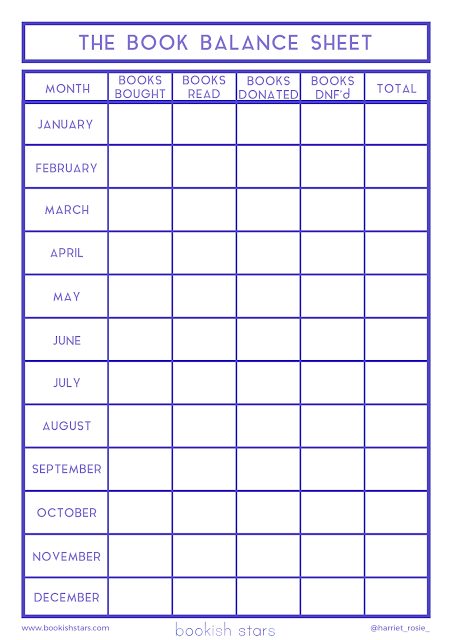 Here's how it works: At the end of every month, you'll fill in each column with either plus or minus numbers. Every book you bought this month and therefore added to your TBR shelf, that's a plus one. Then the rest of the columns are different ways of subtracting books from your TBR shelf! Whether that's because you read them, decided to get rid of them, or DNFed them, they're all minus one. So my goal total is -5 each month, so that basically means that if I buy zero books, all I have to do is read 5 books a month. BUT - so far in January, I've bought 2 books. That's a +2 in the bought books column. So to make up for that, I now need to get rid of 7 books in order to hit my goal of -5. It's not looking like I'll be able to read that many books this month though! I'm aiming for 6, which means at the end of the month I'll have to get rid of a book to hit that goal. Now, I'm not going to get rid of books I'm desperate to read. But I'm also not going to go easy on myself! Among those 180 books, there must be a few that I'm just feeling kind of 'meh' about, so I'll find one, and donate it! Or if I start a book this month and decide it's just not for me, I'll mark it as -1 in the DNFed column since, although I didn't finish it, it's been removed from the TBR shelf. I'm so excited to get started with this and make my first balance sheet update video! (They'll be posted at the end of every month on my YouTube channel, if you're interested) I'm also really hoping that, ironically, this will bring more spontaneity into my reading. Something I absolutely love doing is finding out about a book, getting really excited to read it, buying it, and then starting to read it that same day. Lately, though, with all these unread books on my shelf, I just feel so bad about doing that that I often put that book on my shelf in favour of something that's been there longer. Why do I do that! It's completely ridiculous. So I'm hoping that this will help me do it more, since (1) I'll be getting my TBR books down and (2) if I read a book I just bought then it sort of cancels itself out - so there's no reason to avoid doing it! The thing is - even if I hit my goal every single month, I'll only have reduced my TBR books by 60 by the end of the year, and at the start of 2019 I'll still have 120 unread books sitting on my shelf. That's still a lot of books, but I'm trying to be realistic here! I never want to have 0 books on my TBR, I don't think I'd want to have less than 50, because I love having a big range of books ready to choose from as soon as I finish one. 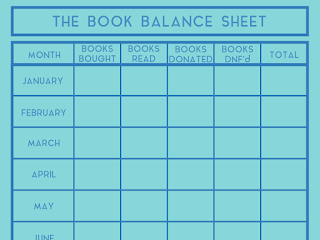 But hopefully with my book balance sheet, I can start chipping away at my TBR over the next few years! 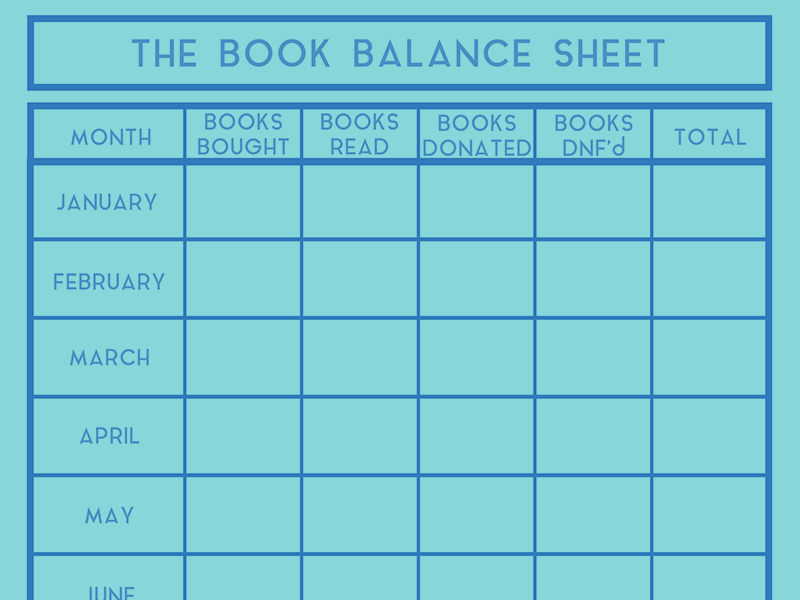 What do you think of the book balance sheet? Click here to download your own copy!